The SVOM Mission (Space based multi-band astronomical Variable Objects Monitor) is a chinese and french project dedicated to the detection and detailed study of GRBs. The launch of the satellite is planned for the beginning of the next decade. Strong bursts of high-energy photons attributed to the explosion of massive stars or to the merger of two neutron stars, gamma-ray bursts are a powerful tool to probe the Universe at very distant times and to study physics in extreme conditions. They are also the most favorable candidates as counterparts of sources of gravitational waves and high-energy neutrinos, two rapidly expanding fields of research. The fleeting nature of the phenomenon and the need to observe it simultaneously in a widest involve spectral band require appropriate equipments. 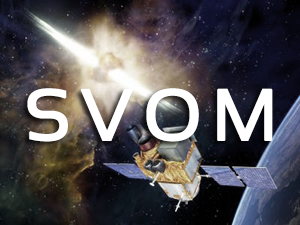 The SVOM mission by providing a range of telescopes in space and on the ground sensitive from gamma rays to infrared light meets this objective. This complementarity of instruments is unique and will allow a detailed study of gamma-ray bursts, from the prompt emission to the afterglow. The Eclairs telescope is the key element of the SVOM mission. It is a X and gamma-ray telescope with coded mask which detects the GRB’s and provides in nearly real-time its localization through a specific software. The position is then refined by the X-ray telescope MXT and the VT telescope sensible to the visible light. The alert signal is received on ground by a network of VHF antenna judiciously located over the globe to allow the follow-up by two robotic telescopes. The CNES is the prime contractor for the ECLAIRs and MXT instruments. The ECLAIRs telescope is developed by CEA-IRFU in partnership with the french laboratories IRAP at Toulouse and APC in Paris. The MXT instrument is developed by the laboratories CEA-IRFU at Saclay, LAM Marseille, MPE Garching and the University of Leicester. The Astrophysical Department of CEA-IRFU is also responsible for the development of the antenna array and the scientific expertise center. The SVOM mission is a scientific collaboration between the Chinese and french space agencies. The chinese and french laboratories involved in the mission are : NAOC at Beijing, IHEP at Beijing, XIOPM at Xi’an, SECM at Shanghai, CEA-Irfu at Saclay, IRAP at Toulouse, APC at Paris and LAM at Marseille. The launch of the satellite by a chinese Long March rocket is scheduled for 2021 and the minimum lifetime of the mission is 3 years.